The second-largest IPO – Synchrony Financial (NYSE: SYF), hitting the market this week – is expected to raise $3.1 billion. Alibaba could raise more than $20 billion. With a price tag that high, Alibaba will be more than just the "IPO of the year." The Alibaba IPO could be the biggest initial public offering in U.S. history. While we don't have an exact date yet for the IPO, we do know Alibaba stock will begin trading within the next several months. In preparation, we've answered the most frequently asked questions from investors regarding this massive IPO. No. 1: When is the Alibaba IPO date? No specific date has been set, but according to reports, Alibaba will be waiting until after Sept. 1 to hold its IPO. Sources cited by The Wall Street Journal claimed Alibaba views September as a busier month for IPOs instead of August. Initially, rumors had placed the Alibaba IPO for some time in early August, but delays are common when it comes to IPOs of this size. No. 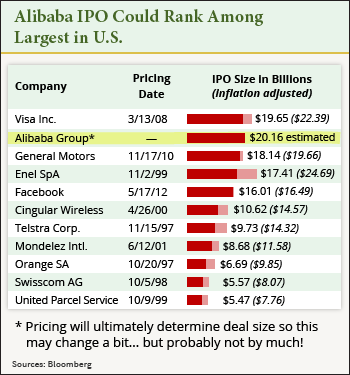 2: How big will the Alibaba IPO be? While estimates are varied on the final IPO price for Alibaba, many analysts expect the Chinese e-commerce giant to raise more than $20 billion. That would make it the largest U.S. IPO ever, surpassing the $19.65 billion Visa Inc. (NYSE: V) raised in 2008. Even the more conservative projections expect Alibaba to raise more than the $16 billion raised by Facebook Inc. (Nasdaq: FB) in 2012, making it the largest Internet IPO in history. No. 3: How much is Alibaba worth? Estimates of Alibaba's value have fluctuated, but a recent survey of five analysts from Bloomberg has Alibaba pegged as a $154 billion company at the time of its IPO. That would make Alibaba No. 27 of more 1,800 companies on the NYSE in terms of market cap. While that $154 billion valuation is one estimate, other projections have ranged much higher. 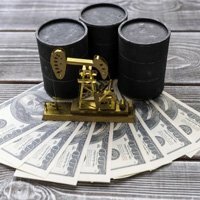 An April poll by Bloomberg had that figure at $168 billion. Piper Jaffray analyst Gene Munster has projected that the Chinese e-commerce giant could be worth $221 billion, including cash. Financial research company Sanford C. Bernstein has set the bar the highest with a $230 billion estimate.